Unless you own a Malamute or Husky, or unless you live in Alaska or in the Arctic, your dog is probably not able to live in extreme winter weather conditions. This being said, if you have an outdoor dog you need to be aware of temperatures when they dip below Zero degrees fahrenheit. 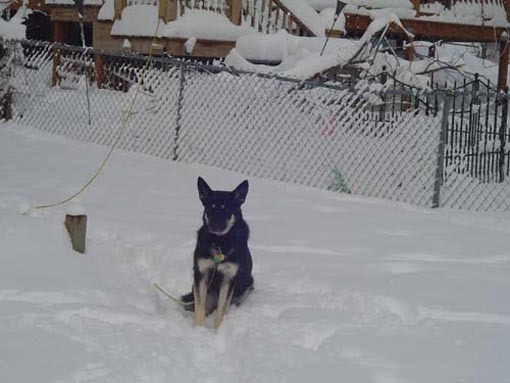 In order to make sure that your dog is safe, you need to set up an area for your outdoor dog that is inside and out of the wind, ice and snow. Since your outdoor dog is accumulated to colder temperatures you could put a kennel or travel crate in your basement for those really cool days and nights. If this is not an option, you need to set up an area in an enclosed building or your garage. Just make sure it has “some” ventilation but is out of the wind. Normally an inclosed garage or barn can be 5-15 degrees warmer than the outside temperatures as long as the doors are closed to the outside air. You can also add straw, hay or old blankets to the area or crate to aid in keeping your dog’s warmth next to your dog. 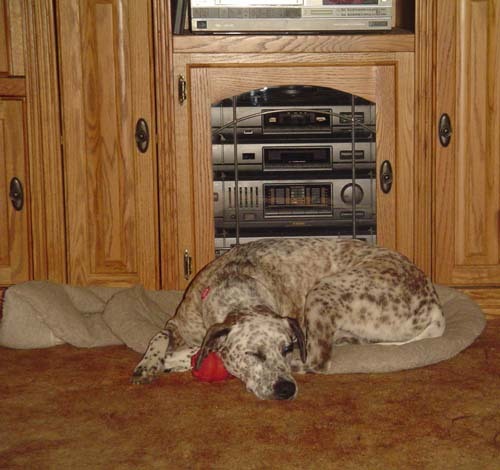 Avoid using a forced air heater that is pointed directly at the dog. If you use a heater it should warm the area, not just the dog. Don’t fool yourself into thinking that a dog house with some straw in it is a perfect winter weather haven! It’s NOT!!! The reason that this is not true is that often these structures are no warmer than the outside because they don’t block enough of the cold. One way to check if your dog’s cold weather hideaway is warm enough is to get in it with a light jacket or sweatshirt on and see if it provides you with adequate shelter from the cold and wind. If your dog is going to be outside and has access to a warm, dry shelter, it is also important to make sure that it has drinking water that isn’t frozen. It’s food should be covered as well. Most importantly, don’t neglect to spend time with your outdoor dog just because it’s cold outside. Remember, your dog needs to know that you are there and that you care. OK, now let’s talk about your inside dog!I know that your dog looks cute when it is all dressed up in it’s little coat and booties, but you really need to resist the temptation to outfit your dog with a “winter wardrobe” before it gets really cold. Your dog was born with a fur coat for a reason. That natural coat will keep it warm well below freezing as long as it is not exposed to wet conditions or the cold temperatures for long periods of time. Neka loved the cold. 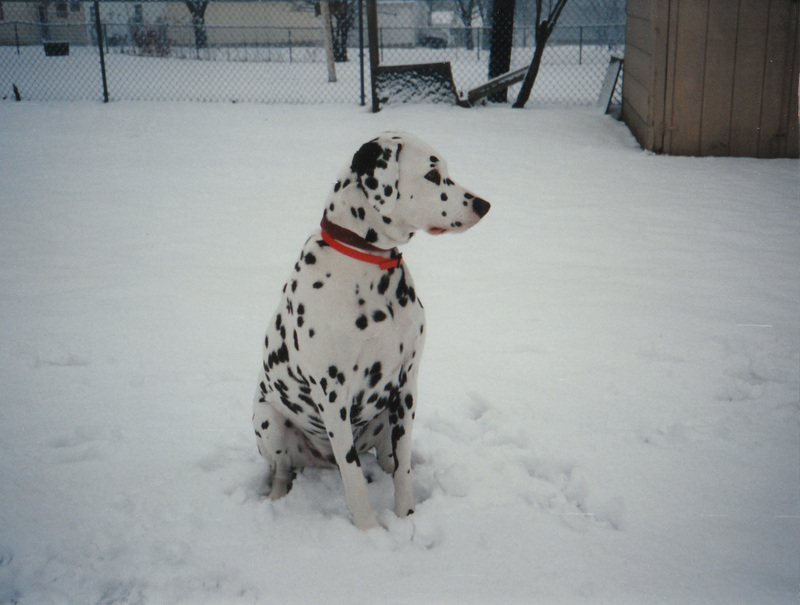 She looked forward to going out and laying in the snow. Dog clothing and accessories are more enjoyable to pet owners than they are to pets who must wear them. In some cases they actually distress the pet. We have to make sure that the clothing actually meets the dog’s needs, not our own. Dog dresser-uppers must make sure that the clothing they buy is not tight. If it is to tight it will actually cause the dog to become chilled instead of doing what it was actually designed to do. It should also not be pulling the dog’s fur, impede natural movement, or block openings for elimination. Next, have you ever gone into your bathroom on a cold morning and wished that the seat had a heater? What do you think your dog is thinking when you open the back door to let it out during the winter? To make your dog’s outdoor experience more pleasant during the winter months try clearing the area where your dog regularly goes to the bathroom. Remove snow and ice from the area and create a path to this area. This will do several things. It will help aid your house training by keeping the dog’s routine as consistent as possible. It will also keep your dog warmer and drier because it won’t have to walk in deep snow, and it will reduce the amount of snow tracked into your home. Inside, make sure that your dog has a warm, dry and comfortable place to sleep. Make sure that it is free of cold drafts. This can be done is several ways. You can just lay a blanket on the floor in a warm place or you can spend a few dollars on a bed designed to fit your dog. The cost of these beds can range widely so shop around and get the right bed for your dog’s needs. I also suggest that you keep an old towel by the door to dry off your dog’s paws and belly after it goes outside. This will keep the dog’s coat clean and dry. Play with your dog more in the winter. 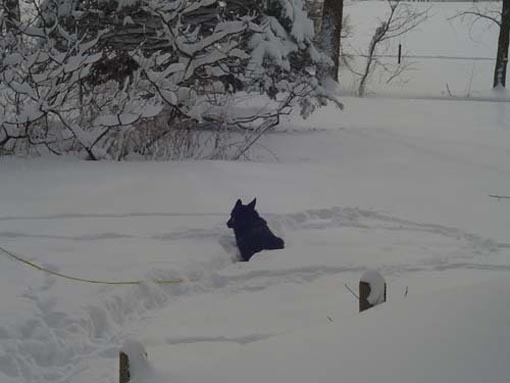 When winter weather makes it hard to get out and do things, your dog is just as bored as you are! It’s very easy for us as humans to “veg-out” when the cold weather gets here. And we adjust to this reasonably easily. Dogs do not adjust nearly as easy! A lot of us pet owners are less likely to take the dog on walks or to the dog park for exercise so this means that your dog is going to be looking for something to do to stay busy. If you don’t play with your dog, your dog will start to look for things to do. And trust me, you may not like what it finds to do. Taking regular daily breaks to play with your dog will provide necessary exercise and mental stimulation to keep your dog healthy and happy. It also offers some human benefits as well. Playing with your dog reduced stress and blood pressure and can also alter your mood. I use the winter months to reinforce training and to work on all of the tricks and commands that I have taught my dog over the years. We also use the time to learn a few new tricks every winter. No matter whether your dog is an inside dog or an outside dog, winter feeding recommendations for your pet may change too. If your dog is going to be outside it should have a food that is higher in fat because your dog burns fat to stay warm. Always check with your vet to make sure that your pet’s food is the right one for your dog’s needs. Also make sure that you aren’t over or under feeding during the winter months. Since your dog relies on a warm coat when it goes outside we advise that you skip going to the groomer and avoid unnecessary bathing in the winter months. Many vets recommend not bathing your dog more frequently than every 6 to 8 weeks to allow the natural skin oils to replenish. So plan your last bathing session for mid November and hold off with the bathing until it warms back up. There are a lot of great “dry” shampoos that you can use through the winter months if you must bath your dog. You can also wipe down the dog with a damp cloth rather than submerging it in water. Try to skip a mid-winter grooming appointment altogether or just ask for a trim instead of a full cut.